The Lady Blazers rank third in rebounding in the Gulf South Conference. Crystal Townsend (21) leads all Lady Blazers with 7.3 rebounds per game. The Lady Blazers are going through a bit of déjà vu. Through the first 16 games of this season, the Lady Blazers hold an 11-5 record, which is the exact record they had last season. It would be quite the stretch to think the Lady Blazers could match last season’s ending of 23-9 and the fourth slot in the Gulf South Conference standings. For the rest of the season, the Lady Blazers will be in the fire. The fire being the GSC, which will unleash a heap of bitter rivals upon VSU. Their two main obstacles will be West Georgia Wolves and West Florida Argos. The Wolves are 9-4 on the season and the Argos are 11-4. Both teams have an advantage over the Lady Blazers, as VSU is in unique and weird territory. The Lady Blazers are one of the worst scoring teams in all of GSC women’s hoops, averaging about 64 points per game. The offensive production is so bad, that no Lady Blazer appears in the top 15 GSC scoring averages for the season. Guard Kayla Bonilla leads the team in scoring with 11 points per contest. The reason for their winning ways is not due their scoring, but how they prevent others from doing it. Defense is what could make their season goals a lot more attainable. In defensive efficiency, the Lady Blazers are top five, which ranks as second best in the Carley Kuhns’ era. Against No. 1 Union University, VSU held the Lady Bulldogs to just 62 points but still lost when the two squads met on Nov 29. It was one of the lowest point totals recorded by Union this season. This type of grit-and-grind play is what makes the Lady Blazers one of the best in the conference. 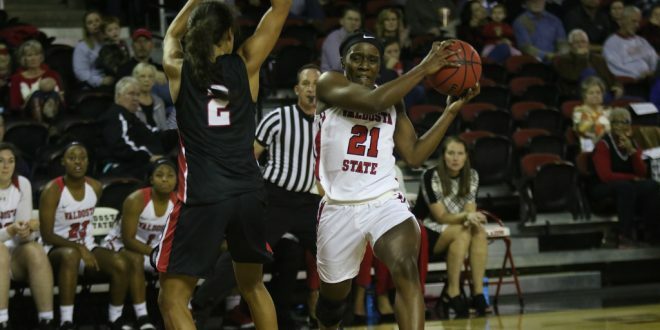 Forward Crystal Townsend averages a team high seven rebounds per game, with Sonya Franklin, Jazmyn McIntosh, and Maddy Corazza also in the GSC’s top-30 rebounders. Though their first 16 games have been an up-and-down battle, they look sturdy even when their shots aren’t falling. It is astounding to think that they are on the same victory path as last year’s squad. A half of basketball to go. The Lady Blazers will host West Georgia at the Complex on Jan 17 at 6 p.m. ET. Next What’s next for the Blazers?